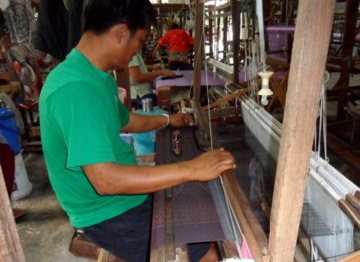 This month we visit a district in Khon Kaen province that’s famous for its special brand of Thai silk, the "mudmee" Thai silk of north-eastern Thailand. 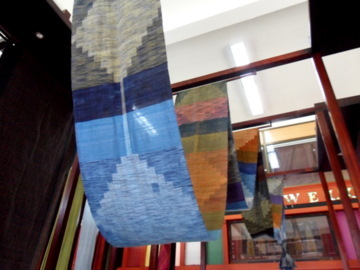 We will get a chance to see the entire process of dying, re-reeling the raw silk, weaving the coloured threads into beautiful silk fabrics that are finally displayed in retail stores in the district. 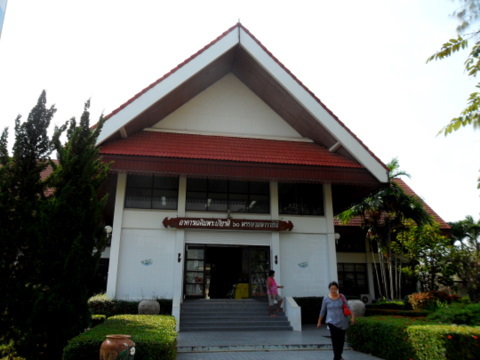 Amphur (district) Chonnabot is one of the 29 districts in Khon Kaen province. 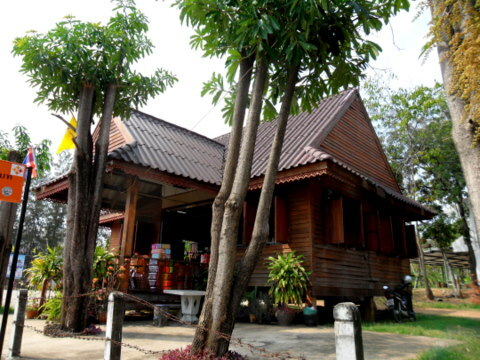 The district is about 55 km south of Khon Kaen city. If you are driving from Bangkok along Highway 2, Amphur Chonnabot is about 12 km off the main highway after you have turned left at the Ban Phai junction. 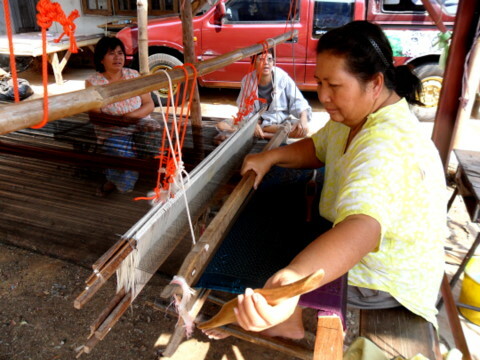 The district is famous for the "mudmee" Thai silk of north-eastern Thailand. 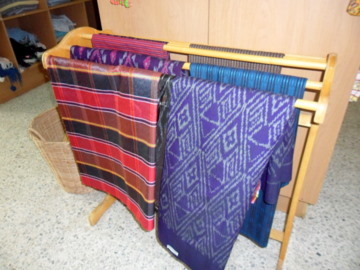 There are several shops in the district selling these beautiful fabrics. 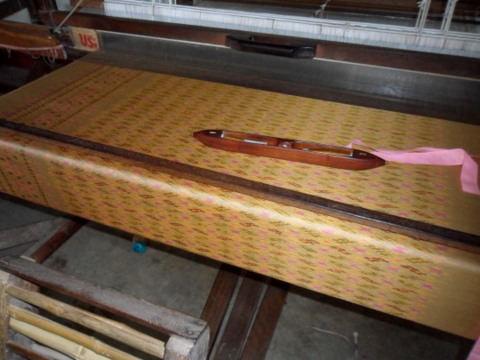 But I wanted to find out how this Thai silk is made. 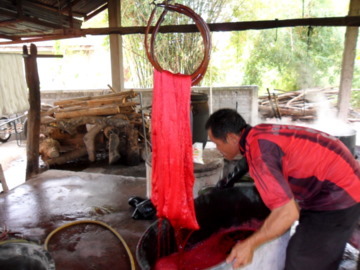 In the process it becomes clear why the silk is called "mudmee". 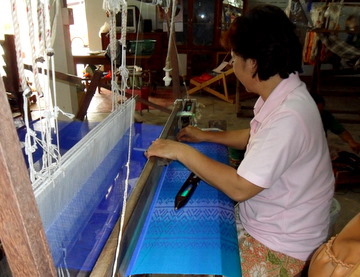 After many enquires and stops at various places, we managed to trace the process of making Thai silk back to its start point. 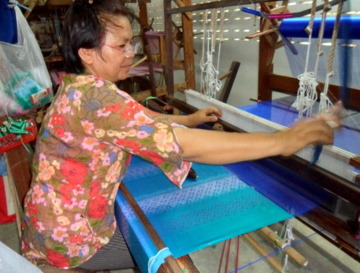 We will now take you on a tour of this process of making the beautiful "mudmee" Thai silk. 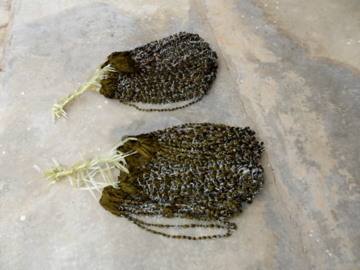 The process of extracting the silk from the cocoons wasn’t included at Amphur Chonnabot. 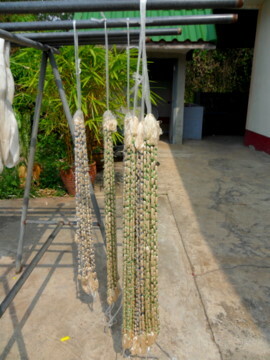 For an idea of the extraction of the silk, please see the Jim Thompson Farm in Pak Thong Chai, Nakhon Ratchasima (Korat). 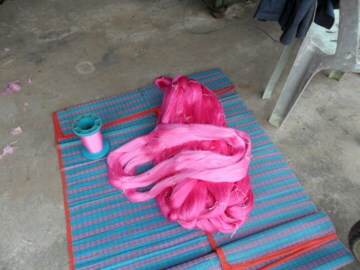 The raw silk arrives in the factory at Amphur Chonabot in coils like these. The silk threads are in various shades of white. They are first dyed in white. 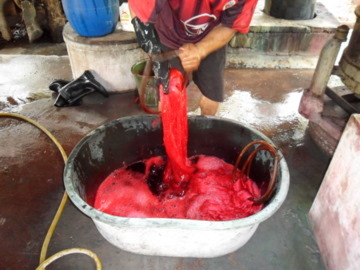 This stage is necessary to maintain a consistency in colour after subsequent dyeing. 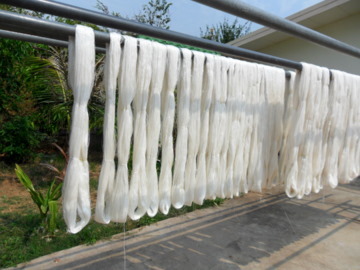 After the stage of dyeing white, the silk coils are left to dry in the sun. 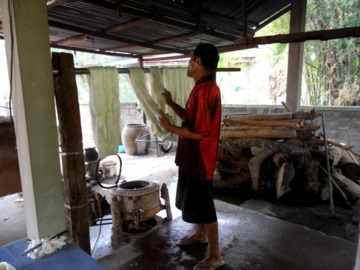 We would like to introduce the master dyer, Khun Tawee who has been on this job for the last 30 years. 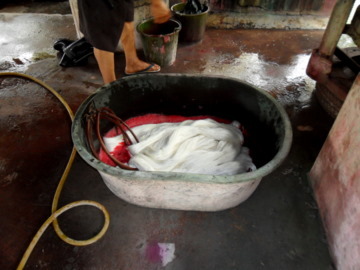 Next the white silk is dyed to other single colours as decided by someone else, not the dyer. Labels with the required colours are stuck on the coils to indicate to the dyer what colours to use. 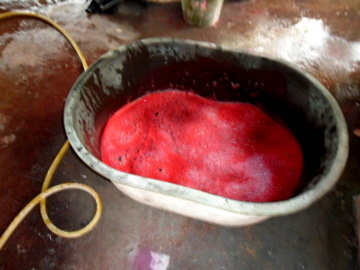 Here you see the white silk been dyed to bright red. 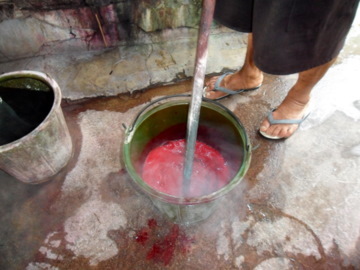 The liquid dye is mixed in a bucket in boiling water, then poured into a tub where the silk coils are soaked for at least half an hour. Next comes the interesting part. From what I can see, there is a person responsible for deciding on the colours. She tags the various coils of silk thread to indicate what colours to dye. 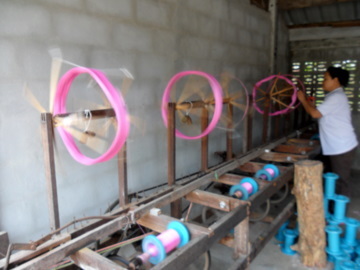 This person also ties the coils of silk thread to produce the multi-coloured threads. This is how the term "mudmee" came about, it’s equivalent to "tie-dye" in English. 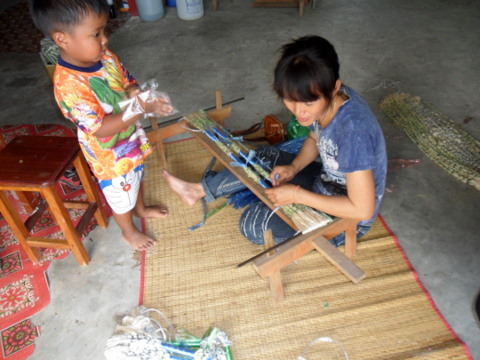 Notice that different coloured strings are used to tie the silk threads. 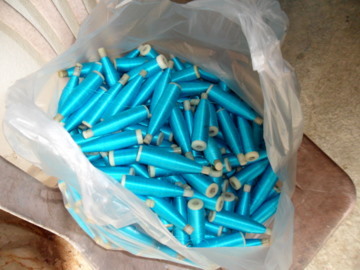 I think this is to indicate the colours to dye the thread. 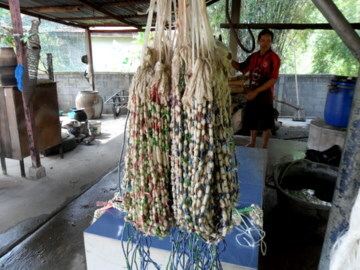 The silk coils that are dyed to the required colours are then taken to the reeling room. 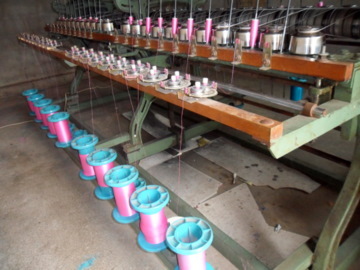 With the help of these mechanical reeling machines, the coils are first reeled into big spools. Later the thread in the big spools is transferred to smaller spools. Silk from these smaller spools are fitted to the looms for weaving the fabric. With the silk dyed to the required colours and reeled in smaller spools, we proceed to the weaving room where there are about a dozen weavers both men and women. 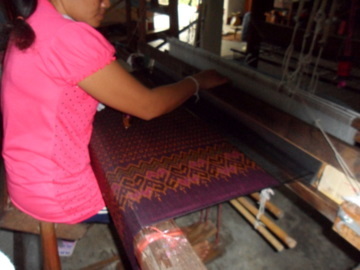 Some weavers are weaving mono-coloured fabric while others are weaving fabric with ornate designs. Just look at the beautiful patterns that are being weaved. I am unable to figure out how they manage to intersperse the different coloured threads into the fabric to produce the patterns. Here is some of their completed work. 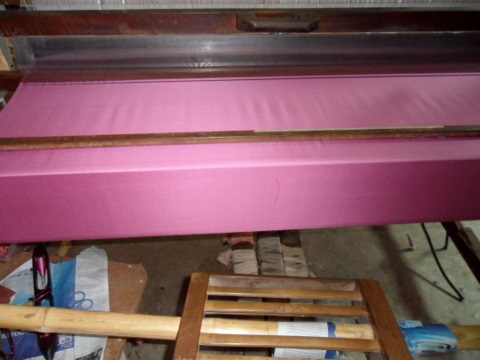 There’s a homely atmosphere in the weaving room where small children are sleeping peacefully behind the looms where their parents are at work. Even the family dog comes along. 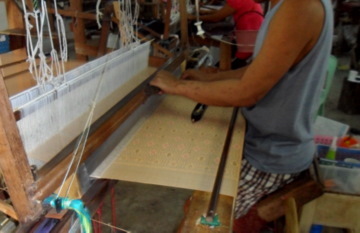 Weaving doesn’t only take place in big factories like the one we visited. 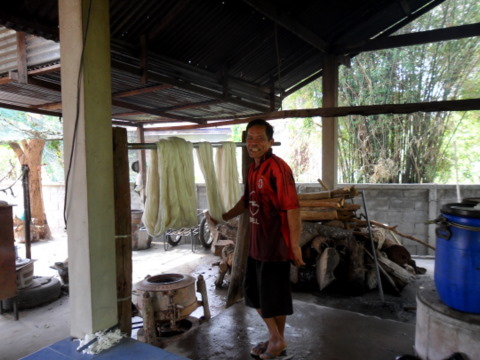 There are a lot of homes in Amphur Chonnabot that take in weaving jobs. It’s almost like a cottage industry in the district. This lady was kind enough to invite us to her front yard where she was weaving silk while chatting with friends. 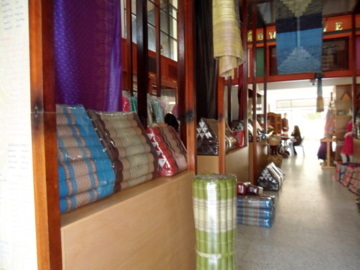 The completed "mudmee" Thai silk products are sold in the many retail shops located in Si Bun Rueang Road like this one that’s in a traditional Thai house. 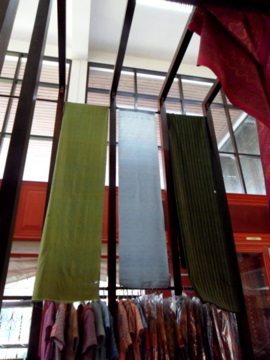 The biggest "mudmee" Thai silk retailer is the Sala Mai Thai or Thai Silk Pavilion that’s on the main road. 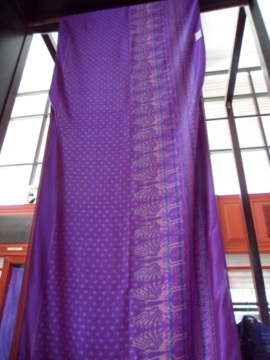 Here’s sample of some of the "mudmee" Thai silk on display. If you are going to Khon Kaen city first, please see map and directions given in map of Khon Kaen in the February 12 issue. 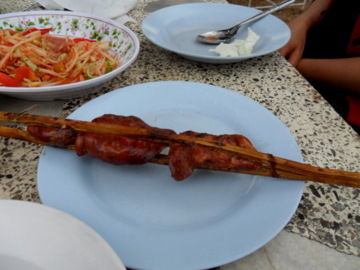 On our way back we stopped at this street vendor along the main road and had the pleasure of tasting one of the best "som tam" (papaya salad) and barbecued chicken liver. 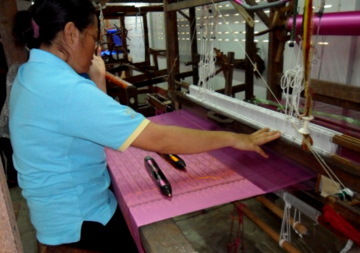 I wish to express my sincere thanks to Khun Phetthai Butchom owner of Rueangthai Thai Silk who kindly consented to let us visit her weaving factory nearby. She even asked a staff member from the factory to come out to the main road to guide us in. To the people of Amphur Chonnabot with whom we had come in contact with during our visit, my sincere appreciation and a big thank you for your warm hospitality and helpfulness. Please see hotels in Khon Kaen for the hotels in the city area. Here are some of the reasonably priced hotels with walking distance of the Khon Kaen Bus Terminal. 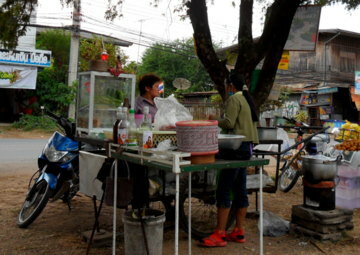 We present the last of the four articles on Khon Kaen.